It is always a challenge to exhibit two artists together. Not only do their works have to relate, but also be visually pleasing. Currently at TarraWarra Museum of Art, in Healesville, the exhibition Patricia Piccinini & Joy Hester: Through Love... presents the work of two very prominent female Australian artists: Joy Hester and Patricia Piccinini. Joy Hester was a significant Australian modernist artist, acclaimed for her highly expressionistic personal drawings. She was supported by John and Sunday Reed, who were patrons and collectors of the arts. Hester was the only female artist to participate in the avant-garde Angry Penguins group. Even though Hester's drawings were often made rapidly, they were still quite intimate artworks reflecting on personal relationships. Patricia Piccinini is known for her large-scale, life-like sculptures. Piccinini blurs the line between the human, animal, artificial and natural worlds using drawings and technology to examine the boundaries. 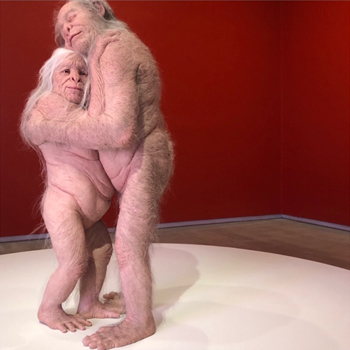 Patricia Piccinini & Joy Hester: Through Love... explores the relationships of love, partnerships, togetherness, human and non-human relationships. 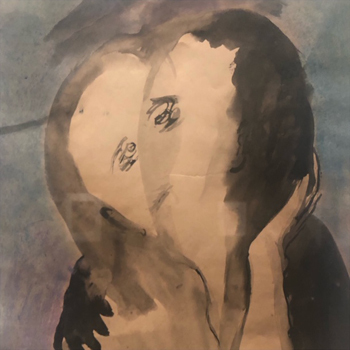 Hester's series Love 1949 and Lovers 1955–56 is on display, as well as Piccinini's drawings, sculptures, photography and video works. Even though Hester was a major influence to Piccinini, I would have preferred to have seen Hester's beautiful works separately. The stand out artwork by Piccinini was the sculpture of two elderly people embracing in the back room. Their tenderness and affection for one another was touching and reinforced that love and intimacy is ageless. Patricia Piccinini & Joy Hester: Through Love... is on until 11 March. Please note: Closed on Friday 22 February and Sunday 24 February, and restricted viewing (1.30pm to 4.30pm only) on Saturday 23 February. Have you heard of the MPavilion? 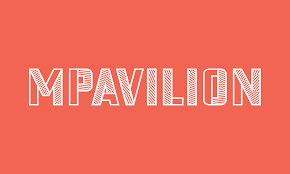 Have you heard of the MPavilion and all of its great free activities? Melbourne is an active city with so many artistic offerings that people (including those in the creative world) are not always aware of what's happening in their cultural backyard. I was chatting to a few people this week about the launch of the MPavilion's 2018 program and many did not know what MPavilion was. The first MPavilion was launched in 2014 and supported by the Naomi Milgrom Foundation – 2018 will be its fifth year. MPavilion is an architectural commissioned space situated across the road from the National Gallery of Victoria in the Queen Victoria Gardens. The 2018 MPavilion is designed by Barcelona-based architect and educator Carme Pinós of Estudio Carme Pinós. She is celebrated internationally for her interest in urban livability and inclusivity, as well as experimentation and poetic, experiential design. A hub for innovative cultural activities for the community to engage in, the MPavilion will be opened every day from 9 October 2018 to 3 February 2019. All programs are free! Talks, workshops, meet and greets and music. It is a platform for creative thinkers and makers to share, create and explore together. I have just spent the last few weeks in Japan discovering the islands of Teshima and Naoshima. It was a wonderful cultural experience, with incredible installations by well-known, established artists – Christian Boltanski, Pipilotti Rist, Yayoi Kusama and Tobias Rehberger to name a few. I was fortunate to have no time restriction, as each island requires at least one day to explore and move from one art space or installation to the other. Naoshima is the most frequented by travellers and is slightly easier to navigate. Teshima was my personal favourite, but a good level of fitness and navigational skills are required as there is a lack of signage. Transport is by foot or bicycle up the mountain or a very slow bus in which you need to wait a while. Accommodation is available on the islands and, if staying in Naoshima, Benesse House would have to be the pick. No photography is permitted in any of the museums or art spaces. It was so refreshing to have people connect to the work rather than their electronic devices connect to it. 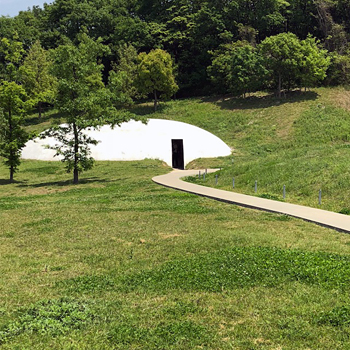 On Teshima, the Art Museum was a sublime spiritual immersion into a white cave. The curved walls and opened ceiling created an experience like no other. It has to be experienced to be fully realised. Even if one could take interior photographs the images would not do the building justice. 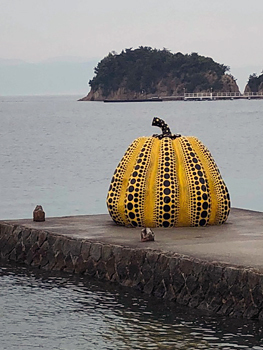 Naoshima was home to several large "pumpkin" installations by Yayoi Kusama and to the Benesse House Museum. 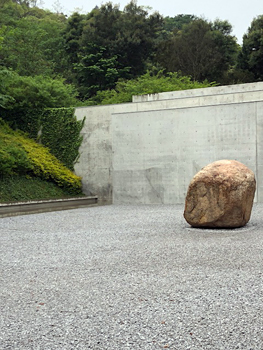 An architectural highlight was the Lee Ufan Museum, a collaboration between internationally acclaimed artist Lee Ufan and architect Tadao Ando. Surrounded by hills, the museum delivered a space for stillness, contemplation and meditation whilst surrounded by the beauty of the natural environment. If you are looking for an art destination, the Setouchi Triennale will take place on the islands in 2019 and is worth attending! The Museum of Old and New Art (MONA), in Hobart, Tasmania, has a new wing. It's called Pharos and was designed by Melbourne-based architect Nonda Katsalidis. The wing houses four new works by James Turrell, installations by Richard Wilson, Randy Polumbo, Charles Ross and Jean Tinguely, plus a new tapas bar named Faro, with fabulous views. After a world tour, Richard Wilson's work 20:50 (1987), which was acquired from London's Saatchi Gallery in 2015, has landed at MONA. 20:50 is an installation consisting of two steel triangles in a small room filled to waist-height with recycled engine oil. It's tempting to touch, it looks like black glass (but it is not) and there is a faint but distinctive smell of oil. It's an optical illusion, magical and beautiful. Only two people are permitted into the room at a time – and it is worth the wait. However, it is James Turrell's work that takes the prize for the best optical experience. 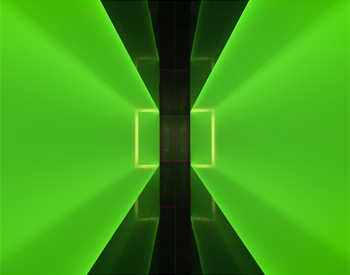 Besides Myself (2017) is a breathtaking tunnel of light that guides you into Pharos. The light is enchanting, optical and continuous. You need to book for The Perceptual Cell and you need to sign many waivers before you enter. This is an intense experience. 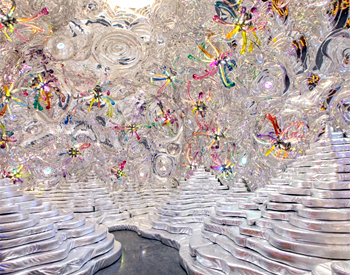 Grotto (2017) by Randy Polumbo looks like a chill-out room at a club and it is the ultimate room to take a selfie! Pharos cost $32 millions, $8 million of which on acquisitions. Once you have absorbed the new artworks, lunch is a must and a perfect way to spend a late afternoon at MONA.